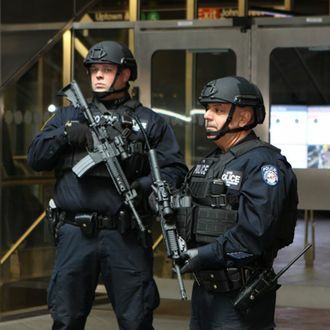 NYPD counterterrorism funding could be at risk. As a candidate, Donald Trump promised to block federal funding to sanctuary cities — generally, those municipalities, like New York City, that refuse to comply with some elements of federal immigration enforcement — and he appears ready to follow through on some aspects of that plan when he takes office. New York City is getting more than $8 billion from the federal government in this year’s budget, though a bit more than $1 billion is in disaster recovery and Hurricane Sandy aid. But that still leaves about $7 billion that could potentially be at-risk if Trump acts against sanctuary cities, according to a preliminary report from New York City Comptroller Scott Stringer. That’s a small portion — less than 9 percent — of the city’s $83.4 billion budget. But certain agencies rely on bigger chunks of federal funds than others. Many of those are programs that provide social services, which means if the Trump administration plugs the funding spigot, the city’s most vulnerable citizens could feel the brunt of that fallout. For example, per Stringer’s analysis, all 39,000 New Yorkers who receive Section 8 vouchers (subsidized rent for low-income people who live in private housing) depend fully on federal funds; if, say, that’s on the chopping block, the city and state would need to come up with more than $480 million, or those families, if unable to afford the unsubsidized rent, could end up in the already overwhelmed shelter system. Other funding the city could possibly lose: about $445 million for free or reduced school lunches; $247 million for Child Protective Services; and $183 million — almost all — of the Department of Health’s money for its HIV/AIDS Prevention and Treatment program. Again, if federal monies are nixed, the city or state would have to make up those shortfalls, and/or reduce, perhaps significantly, the size and scope of these initiatives. And let’s not forget the NYPD. Federal funds make up less than 4 percent of its total budget, but more than 60 percent of the department’s $386 million Intelligence and Counterterrorism funding, a portion of which goes to training the men and women who are now helping to secure the president-elect’s apartment. The comptroller’s full report is available here, and to be clear, the Trump team — still in transition mode — hasn’t targeted any specific funding, or provided really any details what its “sanctuary city” policy would look like. New York Mayor Bill de Blasio has vowed to protect New Yorkers from Trump’s policies, undocumented immigrants among them. “If the federal government wants our police officers to tear immigrant families apart, we will refuse to do it,” the mayor said Monday in his address at Cooper Union. “If the federal government tries to deport law-abiding New Yorkers who have no representation, we will step in. We will work and build on the work of the City Council to provide these New Yorkers with the lawyers they need to protect them and their families.” As Politico points out, that resistance could cost the city — in legal-aid services, for example — in ways completely separate from any potential losses in federal funding.